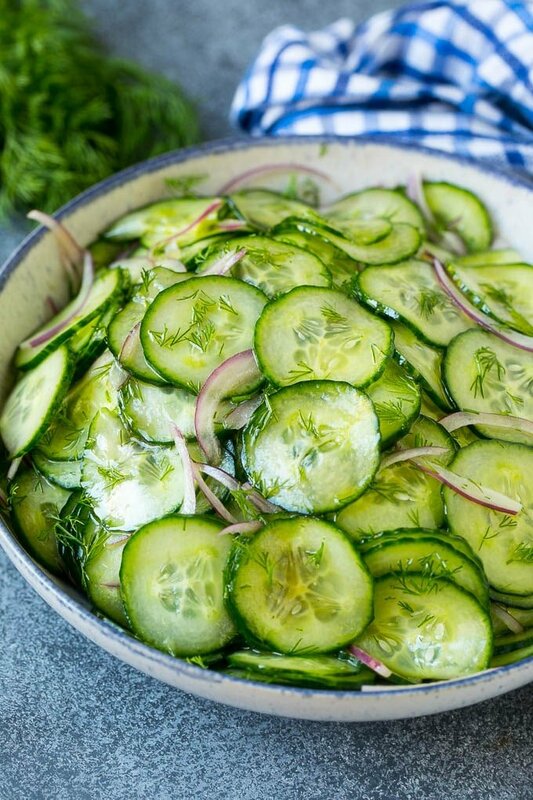 This classic cucumber salad is a blend of thinly sliced cucumbers, red onion and fresh dill, all tossed together in a sweet and tangy dressing. An easy and refreshing salad that takes just minutes to put together. I love a refreshing salad, especially on a hot day. 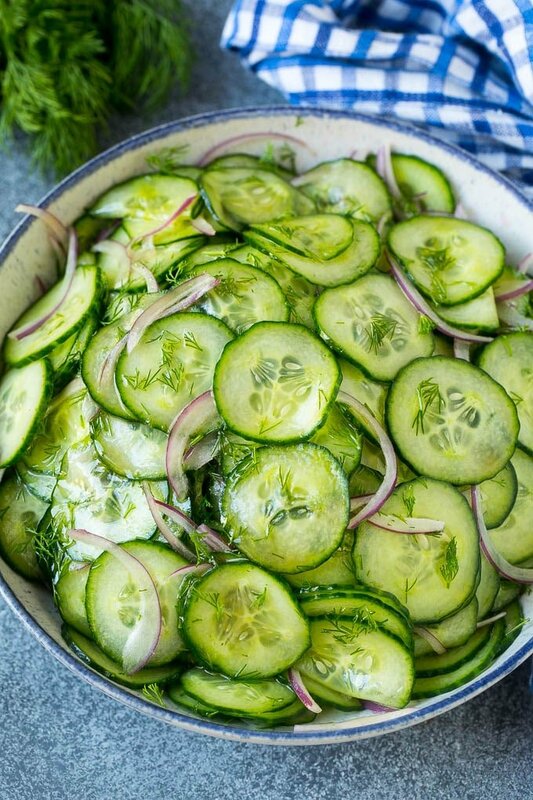 Some of my favorites include cherry tomato salad, watermelon salad and this traditional cucumber salad. You can never go wrong with a cucumber salad, and this version happens to be my all time favorite. Cucumbers are such a versatile ingredient – they’re healthy, refreshing and work in so many different applications. 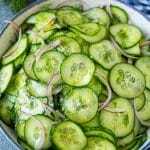 How do you make cucumber salad? 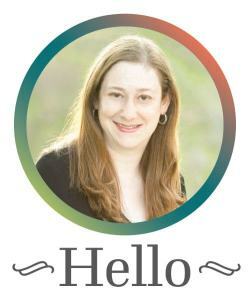 This recipe starts with thinly sliced cucumbers, which are sprinkled with sugar and salt. The salt helps to draw any excess moisture out of the cucumbers which will prevent your salad from getting watery. 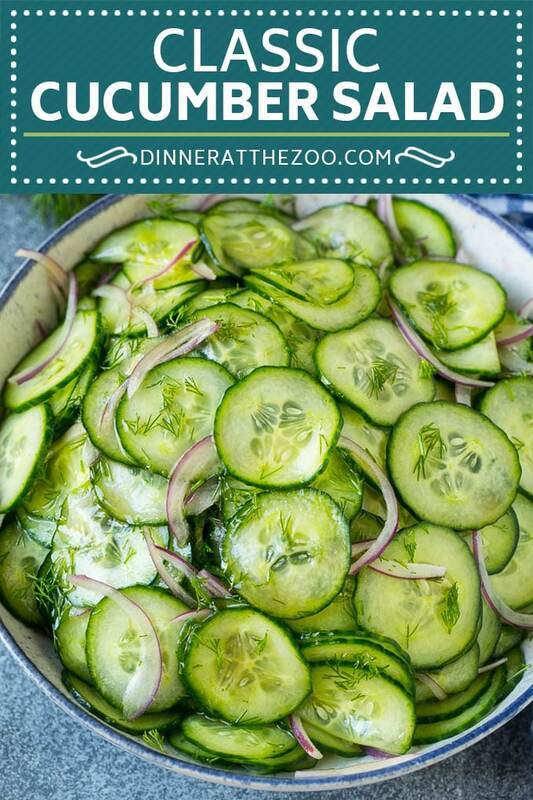 The cucumbers are mixed with red onion and fresh dill, then tossed in a red wine vinaigrette. I like to use English cucumbers for this salad, which are the long cucumbers wrapped in plastic. The skins and seeds of these cucumbers are soft so no peeling required! You can also use small Persian cucumbers or the classic waxy cucumbers. If you use waxy cucumbers, you may want to peel and/or remove the seeds from the cucumbers. I use a mandoline to get super thin slices of cucumber and red onion. Fresh dill is an important component of this recipe, the flavor is so much better than dried dill. You can make this salad up to one day before you plan to serve it. Just be aware that the cucumbers will release some liquid as they sit, so your dressing will be a little more watery the next day. 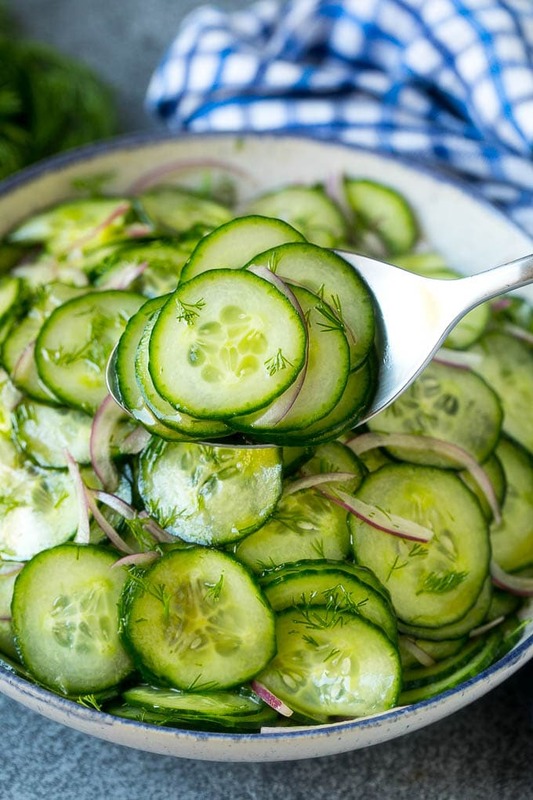 How do you keep cucumber salad from getting watery? 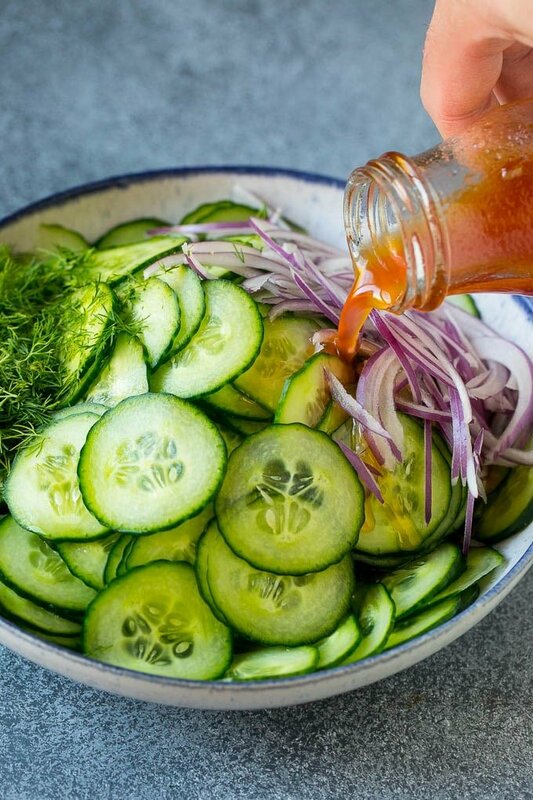 I recommend salting your cucumbers as this recipe calls for, which helps to draw the moisture out of the cucumbers up front so that your dressing won’t get diluted later. I also recommend serving your salad within a few hours of when it’s prepared to avoid excess moisture from the cucumbers sitting too long in the dressing. Cucumbers are loaded with nutrients and are low calorie, low sodium and low in carbohydrates. Cucumbers contain Vitamin C, Vitamin K, magnesium, potassium and manganese. Cucumbers are primarily made out of water, which means that consuming cucumbers will help you stay hydrated. While I love this salad as-is, sometimes I add other ingredients to jazz things up a bit. Tomatoes: Add 3/4 cup halved cherry tomatoes or diced Roma tomatoes. Olives: Add 1/2 cup sliced Kalamata olives. Feta: Add 1/2 cup crumbled feta cheese. Peppers: Add 3/4 cup diced red or green bell peppers. Herb Lover’s: Add 2 tablespoons each of minced parsley and chives. I make this salad almost every week, it’s so simple yet pairs well with a variety of foods. This salad is perfect for a potluck or as a side for grilled meats and fish. Even my kids love this refreshing side dish! 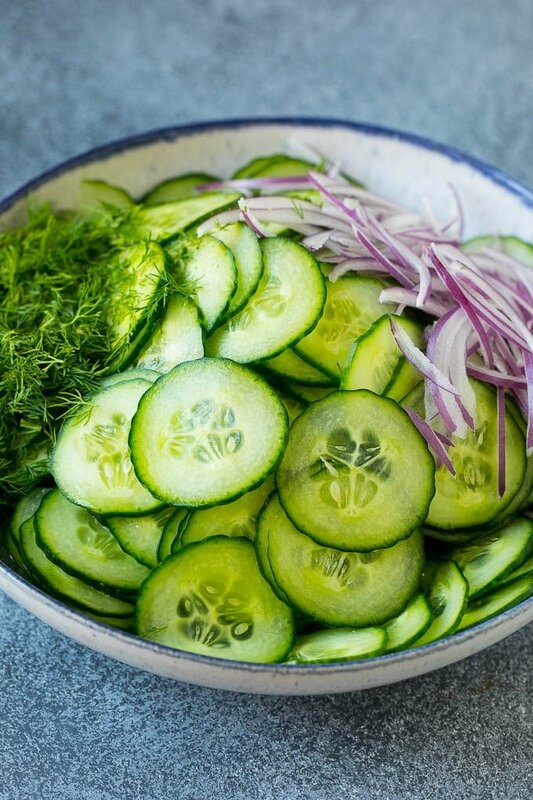 Toss the cucumber slices with the salt and sugar in a medium sized bowl. Let the cucumbers sit for 5-7 minutes. Add the red onion and dill to the bowl. In a small bowl, whisk together the red wine vinegar, pepper and olive oil. Pour the dressing over the cucumber mixture and toss to coat evenly. Let the salad sit for 10 minutes, then serve. This has always been a favorite summer salad of mine. I love this time of year for fresh cucumbers and onions. Looks absolutely awesome! Love those combinations of flavors, gotta give this a try! This salad is perfect for Spring! We love it! This is one of my favorite Summer salads! So light and refreshing! I think this might just become my new summer go-to side dish. So delicious and so easy to make. Winner! I love that bit of red onion in there. Such a lovely salad!